See Also: BMW GS Essential Buyer’s Guide book review. Dual-sport motorcycle sales were up about 28% in 2008, while sales of most of the other motorcycle types decreased about as fast as the sinking world economy. Why is this? Probably because the dual-sport motorcycle, with its modern suspension, tires and brakes, has to be the most versatile machine on the planet. There’s no question — if you can only own one motorcycle to do it all, a dual-sport is it. And the King of the Dual Sports is…the BMW GS. Sales of the big GS have always outpaced everyone’s expectations — including BMW. I don’t own one — I own 4 other BMWs — but I’ve ridden several GS’s and they’re a blast. Surprisingly so. Of course, some riders wouldn’t be caught dead on one (or maybe that’s the only way they would be seen on one). Let’s face it — the GS is the exact polar opposite of a cruiser. Too bad — because I own a cruiser too, and although it’s occasionally fun, it’s much more focused to a particular purpose than the ultra-versatile GS. Of course, the cruiser looks much more like a “real” motorcycle than the Gelände Straße to most people. I’ve ridden with GS owners in the local BMW club and I’ve seen cruiser guys and gals stare at the big GS like the same way one would stare at a motorized shopping cart or maybe a steam-powered lawnmower. GS owners couldn’t care less — in fact, this two-wheeled SUV is all the better for its “different” looks. BMW didn’t invent the dual-sport category by any means; that is a topic that will be debated without end in the local pub. But they sure did popularize it with the advent of the BMW R80GS monolever in 1980. The R80GS wasn’t BMW’s first dual-sport motorcycle though, as you’ll learn when you read “BMW GS Adventure Motorcycle: A 30-Year Catalog”. In fact, BMW has a long history of dual-sport dabbling, starting with some off-road Boxers way back in 1923. So the idea for the GS didn’t just pop into someone’s head in the 1970’s; its roots can be traced back quite far in BMW history. BMW GS Adventure Motorcycle: A 30-Year Catalog is a new book from Parker House Publishing, a new publisher of “enthusiast” books about cars and motorcycles. It’s always great to see a new publishing house take on the world, what with the Internet and YouTube stealing sales from newspapers to magazines. These boutique publishers are apparently now the only ones — and I think will be the only ones left — who continue to deliver to motorcycle owners the rich history of the sport in the form of books with real paper and print and photos that we can actually touch, view, smell and feel. It’s the only way to fly folks (which is a huge irony, considering that I’m writing this for publication on the web!). I don’t know how long Parker House has been in business — not very long, I surmise — but they sure picked a great subject and a fantastic book for a start. 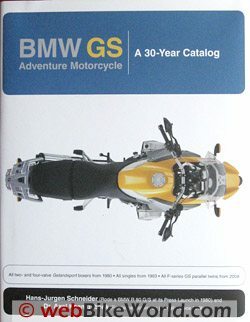 the BMW GS 30-Year Catalog is chocked full of history and photos of the now famous GS series, and it covers everything from the aforementioned 1923 off-road Boxer right up to the latest and greatest F800GS,just reviewed on webBikeWorld this week by HBC. The book is loaded with details and many photos and illustrations. But the interesting part is that even with all the zillions of BMW and GS photos published over the years, the authors were still able to find more originals. Maybe a close connection with the factory? They even cover the GS in the Paris-Dakar rallies, and I’m not sure if all modern GS owners even know that at one time, BMW was highly supportive of the Dakar rally and they did very well indeed. Hopefully, with the re-emergence of the racing gene in recent BMW DNA, we’ll see more GS race action (and indeed we have, with the HP). The authors are thorough, even covering the eclectic BMW trio, the Xchallenge, the Xmoto and the Xcountry motorcycles. This isn’t a “slam, bam, thank you ma’am” publication either — it’s a well-researched, nicely planned book with hard covers, thank you very much! It even has a jacket! When’s the last time you bought a book with hard covers and a jacket?! Now this isn’t a brand-new volume, actually. It is, however, the first English language edition. According to the publisher, it’s actually a version of the 5th edition of author Hans-Jurgen Schneider’s “Fascination BMW GS”, first published way back in 1992. This edition was revised to cover the latest GS series bikes. Hans-Jürgen Schneider is said to have ridden every GS bike since the beginning, along with many other dual-sport motorcycles produced by competitors. He was the motorcycle editor of Auto Zeitung in Germany, so he knows his stuff. Dr. Axel Koenigsbeck is a collector of German motorcycles and also a freelance motorcycle author, and both have done an excellent job bringing us this extensive history of what can now be claimed as one of the most popular motorcycles ever produced. All GS owners, BMW lovers, BMW dealers and anyone else interested in motorcycle history needs this book. And, if you don’t know what a “Red Devil” is, you’ll find out about it here! 2010 Update: The book is now in its Fifth Edition, with updates to late 2009. The list price is now $50.00. From “P.G.” (February 2012): “I have ridden for 50 years and the BMW R80G/S 1980-1981, next to my Vincent Rapide, is my favourite bike of all time. In fact, it’s better as far more versatile and I have owned and worked on dozens. I saw it in Park Lane BMW on it’s first UK release year and bought it at once for a princely 1,998 Sterling. Now that I have added the German-built 1000cc kit (using stock carbs and cams), a German enlarged disc brake with racing pads, Progressive fork springs and added an Öhlins rear shock, this bike is even better than when I bought it in 1981 – it’s perfection. Taut, with that communication through the bum like a racer, powerful yet mild and comfortable when needed…..and like it always was, but more so, now whispering more every minute, “Give me miles to eat”. The minimalism and simplicity of the non-Paralever G/S is brilliant. The frame is pure Norton featherbed, but the back end is genius with the monolever. It’s hidden complexities are endless. I will never sell or part with this machine, due to it’s superb on road and very decent off road (no, not mountain trails but try gravel, 3rd world dirt and intercontinental roads) performance and build quality. Name the bikes you can change the conrod bearings without splitting the crankcases and change the clutch and gearbox without taking the engine out of the frame..and that’s for starters. As for a round-the-world machine, it has never been bettered. You will get along faster on the world-travel superhighways..and another fella will wipe my mudguards on twisty ,muddy trails… but put tar, road, gravel, sand, rain and fast dirt together and i will get there quicker, and relaxed at the end, every time. And that’s what long distance biking is all about. The stability of the G/S is so awesome that I hit a tribal goat square on the right cylinder at 65 m.p.h. in Africa, twitched once, rode on and saw the goat dead in the road behind me. I’ve also left a 50mph crease on a wayward Peugeot Partner along the whole side (those wonderful airheads again!) that strayed into my lane and took out his front bumper…and stayed on. The quality of the sadly unobtainable now Akront allow rims is so good that after 30 years they run true. And I can get every part, new or good replica, 30 years on. When I see the monstrous, lumbering computerized “bikes-for-nincompoops” that BMW makes these days as equivalents, I shudder. Will I take a straight swap of a 2012 “equivalent”..no thanks. How about if you offer your new “GS” plus a lot of cash? No, no, no.